An ill fitting hat either too big or too small is not ideal, so it’s important to be able to measure your head correctly to get a well fitting hat, particularly these days if purchasing on the internet. Hat sizes are calculated by measuring the circumference of your head about ½ inch (1.3 cm) above the ears. Inches or centimetres are used depending on the manufacturer. If you are in between two sizes, choose the bigger size. You can always pad a hat smaller. 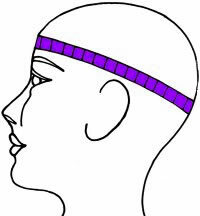 If some adjustment is needed then felt hats can be stretched or some hats are adjustable such as hard hats and baseball caps. Cheap hats come in standard sizes such as small, medium and large. Traditional hat size is worked out by adding the fore and aft and side to side measurements in inches then dividing by two. In the UK, an equivalent hat size is an eighth of an inch smaller than that of the US.